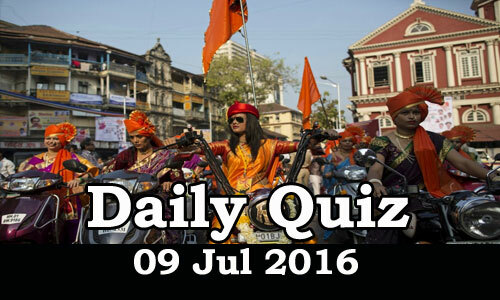 Daily Current Affairs Quiz 09th Jun 2016, Current affairs and GK questions on National and International are listed in the Quiz. Candidates those who are preparing for Government Jobs and IBPS/SBI/RRB exams and all other exams can use these questions. 1. How many Mou’s were signed between India and South Africa at recently held India-South Africa CEOs forum? 2. Which city is to host the first ever SAARC Tourism Summit? 3. How many Krishi Vigyan Kendras are working for farmers to assess agri-technology and demonstrate to farmer’s application and capacity development? 4. Department of Posts and Portugal Post will issue joint postage stamps on the theme of which among the following folk dance forms of India? 5. Which state government has proposed a “Fat Tax” on fast food items like burgers, pizzas, donuts and pasta etc. served in branded restaurants in a bid to discourage the junk food culture? 6. The Left Democratic Front government in Kerala announced a pension scheme, starting this year, for transgenders above 60 years of age. Who is the chief minister of Kerala? 7. Which among the following cities to host the three-day Woodpecker Environment and Wildlife Film Festival? 8. Name the mobile application developed by Arunachal Pradesh government that includes useful information about the district like history, geography, culture, disaster management, first aid guide, tourism, one touch helpline, etc. 9. Which state government approved the new Slum and Jhuggi-Jhopdi Relocation and Rehabilitation Policy? 10. Meghalaya cabinet has approved the formation of the fifth pay commission to increase the salaries, allowances and pension of State government employees. Who is the chairman of fifth pay commission of the state? 11. Which state government has taken up a project to set up three biotechnology hubs across the state to bring in more biotechnology innovations to the State? 12. Who among the following has set up a cyber-cell to tackle trolls that harass women and children online? 13. The tropical cyclone ‘Nepartak’ is approaching towards which of the following countries? 14. The IMF has announced a ____ billion dollar program for Iraq to help strengthen the country's finances, hit by the crash in oil prices and the fight against the Islamic State group. 15. Who among the following has been appointed as the new CEO of IDFC Mutual Fund? 16. Who has been named as the Controller General of Defence Accounts (CGD[A]? 17. Who will become the first woman in the world to receive the Award for Exceptional Bravery at Sea for 2016? 18. How many Indian hotels have made it to the 'Travel + Leisure' magazine's 100 Best Hotels list? 19. Waterfront resort Nihiwatu, has been voted the World's Best Hotel in a survey by the Travel + Leisure magazine. The resort is located in which country? 20. Eminent philanthropist, social activist, ascetic and humanitarian Abdul Sattar Edhi died. He belongs to which country?